Birdie Media’s product costs include consultation, graphic design, art proofs, production setup and order tracking with no hidden charges. Customers must maintain posted product minimums. Shipping is free for domestic orders over $150, however; artwork must be 100% approved ten weekdays prior to requested in-hands date to maintain normal, non-holiday shipping schedules. 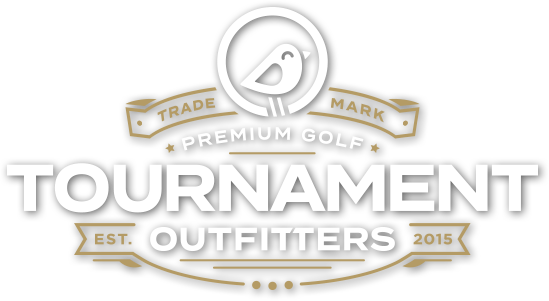 Birdie Media works one-on-one with golf event coordinators to fulfill their sponsor signage, promotional and apparel requests. Logistics, eye-catching graphics and hand-selected products are custom tailored specifically for your event. Our talented staff carefully manages each step of the development & production process keeping you informed from initial order placement to final product delivery. Website orders are preferred, howerver; sometimes answers are needed before customers feel at ease placing their order. In that case, please call us directly at 800-218-1205 and we will address those questions. In either case, a Birdie Media representative will reach out to confirm your order, procure sponsor logos, explain our production process and schedule the preferred delivery date. Our goal is to provide a simple and pleasant shopping experience. We look forward to helping make your golf event successful. 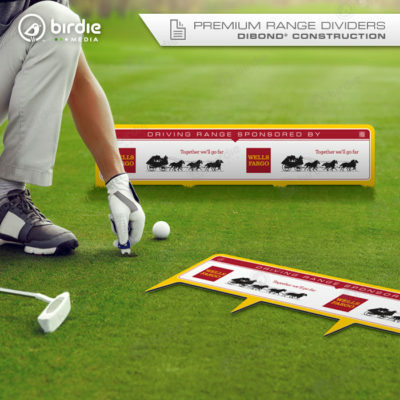 From sponsor tee signs to feather flags to custom golf tents, Birdie Media has compiled a group of various signage types used most commonly for golf tournaments. 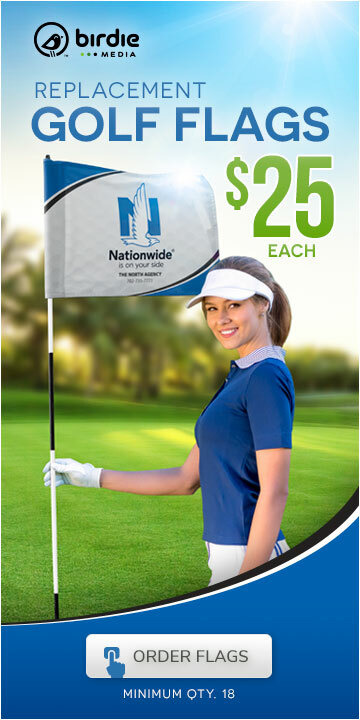 Logo golf balls, goodie bag kits, drinkware, towels and much more... Birdie Media has your promo needs covered and we are always adding new golf-related items of interest. 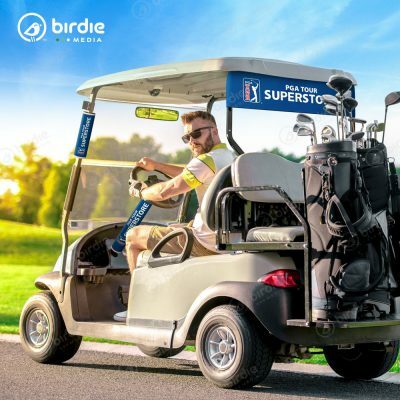 Birdie Media offers both brand name & general polos, golf caps t-shirts and caddie bibs in a wide range of materials and costs to suit almost every golf event budget. 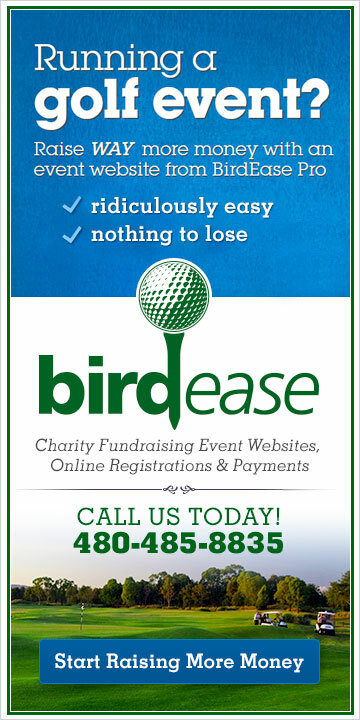 Since 2015, Birdie Media has been developing and supplying signage, promotional products & apparel to over 350 U.S. golf tournaments and charity events annually. Our golf products are premium quality, attractively designed, competitively priced and ship for free. Tournament coordinators have come to rely on our talented staff year-after-year to help them fulfill their diverse list of sponsored products. Our one-on-one customer service makes it easy for them to express their needs and our comprehensive art proof ensures sponsor accuracy and on-time product fulfillment. 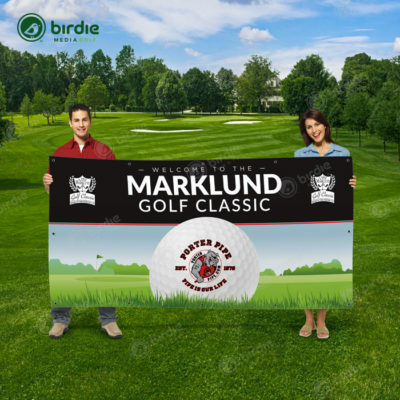 Every sign Birdie Media creates is customized by one of our in-house professional graphic designers to directly reflect your event sponsor’s existing branding. All of our signage maintains a consistent look & feel and Birdie Media utilizes high-quality vector logos whenever possible to ensure crisp reproduction and color accuracy. Completed signage is carefully packed and encased in foam spacers, cushioning and rigid boxes to keep items structurally secure through transit. Birdie Media is adamant about securing each sign to maintain the shape and form so they arrive without creases or dents. We will ship to your home, business or directly to your golf event — simply make arrangements with one of our customer service representatives and we’ll ship to your desired location. Birdie Media was founded by Greg Sanchez and Aaron DeCarlo – two guys with a passion for quality, aesthetics and creativity. Birdie Media adheres to the philosophy that creativity and forward thinking helps businesses evolve and adapt to our every-changing world. Even the very best products will not survive indefinitely without evolution, adaptation and refinement. There is always a better way of doing any job and it is our task to seek out new methods to become more effective and efficient. We truly believe in the transformative power of media plans that simplify communications, elevate experiences, engage and inspire people everywhere. Great plans and solid relationships come from collaboration. We’re excited to learn about you and make something beautiful together. We owe a huge thanks to our community for joining us on this awesome journey, and we hope that you’ll continue to be a part of our story. Organizing and managing a golf tournament is no easy task and is often times very stressful. A successful tournament must ensure that several components smoothly and seamlessly coalesce. It is imperative that sponsors and players feel that their money was well-spent and golfers should leave eagerly awaiting the next annual event. Trust Birdie Media to help make your next event successful and you’ll understand why our business boasts a customer retention rate of over 93%. Our outstanding customer service and eye-catching products are only the beginning. Birdie Media’s continued mission is to establish and maintain meaningful customer relationships that will last indefinitely. 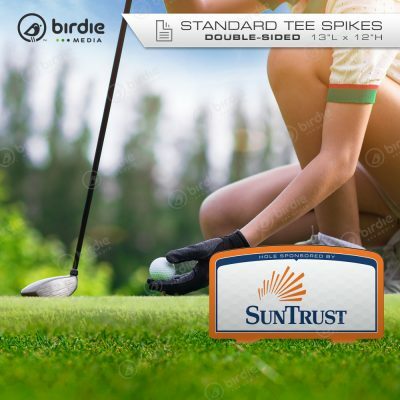 e: golfsales@BirdieMedia.net \ \ p: 1-800-218-1205.